Caldecott Models appeared in the early years of the 2000s, and produced diecast models of Australian cars in 1/43 and 1/72 scale. Some of the models made their way to the U.S. around 2004, but the company seems to have disappeared in the following years. They made two diecast cars in 1/72 scale – the Ford Falcon XC Coupe, and a Ford Falcon XY GTHO – both in a few different color schemes. I have been aware of the models for a number of years, but never ordered any, due to the cost of shipping from Down Under. However, that has changed, and I am now in possession of a Falcon XC (John Player Special) in black and gold, and a Falcon XY in "diamond white". I actually ordered three of the XCs due to their similarity to the Falcon XB, and I will try to convert one of them into the post-apocalypse version of the Pursuit Special from Mad Max 2: The Road Warrior. 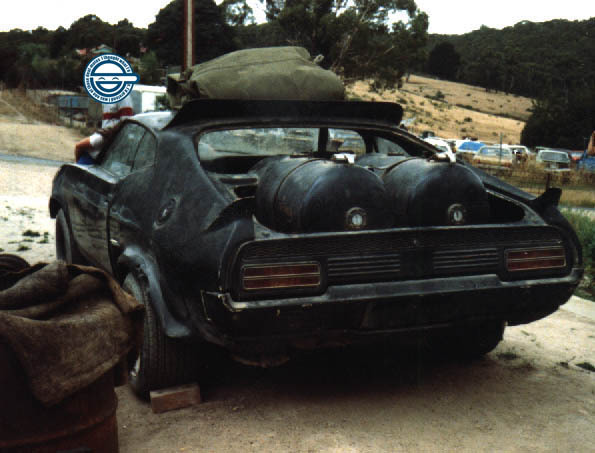 Sent to the scrapyard after filming. Rectangular headlights... Doesn't that mean the car is a Fairmont? I don't have any plans to create the car from the first film at this point, but I'll keep the extra model around just in case. The really nice thing about these cars (from the perspective of someone who wants to do modifications), is that the body is attached to the chassis by screws rather than the typical rivets used for diecast cars. Anyway, the models are nicely detailed, and a nice change from the typical German, Japanese, and U.S. cars that dominate the 1/72 diecast world. Have You seen these post-apoc 20 mm? I think I have one or two of those Warlands dune buggies buried somewhere in my stash. I thought about getting their Interceptor, but I'm not a big fan of solid bodied resin car/truck models.